We are one of the original and largest inflatable boat paint suppliers. We've helped thousands of satisfied customers restore their inflatable boats. Renew your old, faded, sticky, deteriorating PVC or Hypalon inflatable boat with our proven inflatable boat paint using our inflatable boat paint, for inflatable boats, inflatable kayaks, dinghies, inflatable canoes & inflatable boat accessories. Restore Your Old Inflatable Boat. Great for Hypalon and PVC boats of all makes and models. Great for Hypalon and PVC boats of all makes and models. Inflatable boat paint is great for restoring for inflatable boats, inflatable kayaks, dinghies, inflatable canoes, inflatable boat related accessories and other inflatable products. It can renew and protect your inflatable by adding a layer of strong, UV resistant synthetic rubber that bonds directly with your existing surface - PVC or Hypalon. Our inflatable boat paint paint has done wonders on Zodiac, Avon, Bombard, Caribe, Quicksilver and dozens of other inflatable boats and kayaks. Add years of pleasure to your investment with Tuff-coat and save money by not having to buy a new boat or invest in major repairs and fabric recovering! Why should you paint your inflatable boat or kayak? Thousands of restored inflatable boats and happy customers who saved money. Easy to apply - clean boat, apply basecoat and topcoat in stages, let dry, cure, go boating! Restores faded, sticky inflatable boats to look renewed with enhanced protection and appearance. Applicable for Hypalon and PVC - using slightly different application procedures, it's great for both types of inflatable fabrics. Unlike other coatings - superior adhesion to the fabric and increased protection, durability and an overall better appearance over other 1-part coatings. Long lasting painted boats last for years and show no signs of deterioration. Fixes pinhole leaks, covers chafed areas, covers worn, exposed fabric and old patches. 5 colors - gray, white, red, orange and black. Custom colors available on bulk orders. Major restoration kits comes in "Pontoon Kits"- which covers the respective inflatable boat pontoons only - not including the outer floor, in the color specified, and "Pontoon & Floor Kits" - which covers the respective inflatable boat length and outer floor (the side of the floor that is in the water), in the color specified. How To Select The Best Paint For Your Needs? Read these below to determine which repair products are best for your needs. Then read further down the page for more details and ordering options. Sticky PVC Fabric? Add a protective coating easily and inexpensively with Liquid Rubber, Top Side Paint. Chaffed fabric? 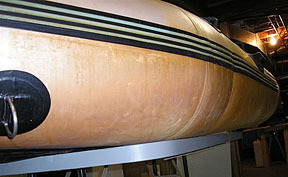 If your inflatable boat has chafed fabric, abrasions, and other damage, re-skin it with Liquid Rubber. Peeling Fabric? If your inflatable boat's top layer of Hypalon fabric is peeling off, re-skin it with Liquid Rubber. Faded Fabric? To renew or change the color of your inflatable boat, use Top Side Paint. Color change needed? To change the color of your inflatable boat, use Top Side Paint. Minor Restoration? If your inflatable boat needs some fabric repairs and paint, consider a Minor Renewal Kit. Major restoration? If your inflatable boat is in rough shape with abrasions and scuffs, consider a Major Restoration Kit. If your inflatable boat has chafed fabric, abrasions, and other damage, you may need to reskin its outer layer with Liquid Rubber. This product essentially adds a new layer of rubber to your existing inflatable boat fabric. 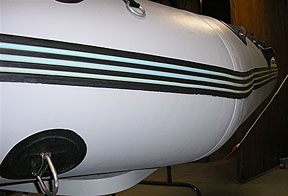 Liquid rubber (black, white or gray) can be used alone or can be covered with Topside Paint (see below). This will make the surface of your inflatable like new. Many of our customers have used Liquid Rubber and our Top Side paint to repair and restore inflatable boats that were 10 to 15 years old. See details, pictures and ordering here. If your inflatable boat is looking faded or you want to change the color, repaint it easily and inexpensively with Top Side Paint. An inexpensive way to renew your inflatable if it is in good shape and doesn't have major abrasions, scratches, and related damage. 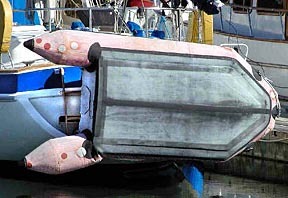 If you want to improve the looks of your inflatable boat a new coat of paint will always work. Make your inflatable unique. Add color and style to you inflatable restoration project. Top Side paint may be used on new inflatable boats to make them look newer or on old inflatable boats to make them look new again. See details, pictures and ordering here. If your inflatable boat needs a basic fabric reskin and paint, consider a minor renewal with this Minor Renewal Kit. Works on Hypalon and PVC fabric inflatable boats and other inflatable products. The kit includes: 1 bottle of sealant, 1 quart tin of liquid rubber (gray only), 1 quart tin of topside paint (black, gray, or white), and 1 stencil kit (with stencil paint also). See details, pictures and ordering here. Use Tuffcoat, a premium high quality 2-part paint for major repair & restoration of old inflatable boats, kayaks, and other products. Restores old, damaged, abraded, faded, sticky boats to looking renewed with enhanced protection and appearance. Tuffcoat inflatable boat paint comes in 5 colors. First apply the thick, strong basecoat, then apply the thinner colored topcoat. 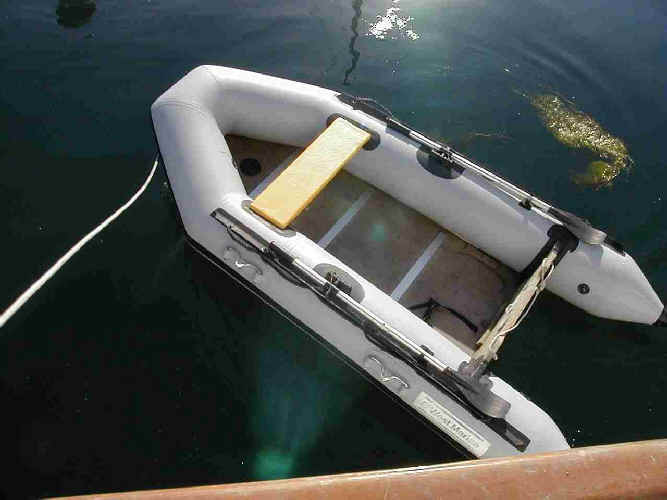 Comes on kits for different size inflatable boats including "Pontoon Only" kits and "Pontoon and Floor" kits. Both sets of kits available for boats up to 24 ft long. For ease of ordering we have pre-calculated and pre-packaged the amounts of base and top coat paint you need for your size of inflatable boat into common size "kits" to ensure you have enough paint, based on if you are covering just your "pontoons" or "pontoons and floor". Subject to your boat size, this may leave you some left-over paint for future touch-ups. Remember....as boats get longer the tube diameter and overall surface area gets larger therefore more paint must be ordered to take this into consideration, not just added length. Step 1: Find your boat length from the list below. Step 2: Decide if you want to paint just your "pontoons only" (tubes), or your "pontoons and the outer floor" (the side in the water). Step 3: Click the link below for the kit that meets your needs based on decisions from steps 1 and 2. You'll go to our secure e-commerce sister store (AllboatProducts.com) to view more information and pictures, and to purchase. Step 4: From there, you can select what exact color you want. Still unsure? Contact us for help. Larger kits also available with volume discounts. Contact us for prices. Before you paint, ensure your boat has no leaks , holes or tears. View sealant products here. and view fabric and glue and repair kits here.